Golan Levin's artwork focuses on the design of systems for the creation, manipulation and performance of simultaneous image and sound, as part of a more general inquiry into formal languages of interactivity and of nonverbal communication in cybernetic systems. Through performances, digital artifacts, and virtual environments, often created with a variety of collaborators, Levin applies creative twists to digital technologies that highlight our relationship with machines, make visible our ways of interacting with each other, and explore the intersection of abstract communication and interactivity. Since 2002, Levin and Zachary Lieberman have collaborated on a variety of projects together, using the name Tmema to represent their collective work. Levin has exhibited, performed, and lectured widely in Europe, America and Asia. 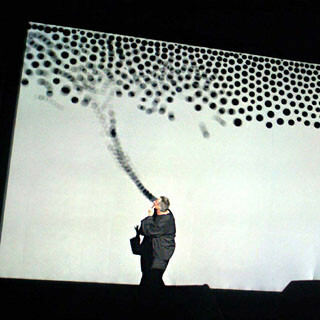 His work has been shown at the New Museum of Contemporary Art, The Kitchen, the Neuberger Museum, and The Whitney Biennial, all in New York; Ars Electronica in Linz, Austria; The Museum of Contemporary Art in Taipei, Taiwan; The NTT InterCommunication Center in Tokyo, Japan; the Zentrum für Kunst und Medientechnologie in Karlsruhe, Germany; and MoMA, among other venues. His funding credits include grants from Creative Capital, The New York State Council on the Arts, the Pennsylvania Council on the Arts, the Rockefeller MAP Fund, The Greenwall Foundation, the Langlois Foundation, and the Arts Council England. His work is represented by Bitforms Gallery in New York City.